Every automobile engine has one or more camshafts which causes the intake and exhaust valves to open and close. Every engine also has one crankshaft, which causes the pistons to move up and down in the cylinders. The valves must open and close at exactly the right time in relation to the piston movement in order for the engine to run. It is a timing belt or chain that connects and keeps the camshafts and crankshaft synchronized. A chain drive is more complex, noisier, heavier, and more expensive to build, so its not surprising that most car makers choose to use a timing belt. A timing belt is a flat rubber belt reinforced with fiberglass or similar strong fibers with rubber teeth molded onto the surface. These teeth are driven by the complementary teeth on the camshaft and crankshaft sprockets. Because the belt is made of rubber and subjected to extreme stress and temperatures it does require periodic replacement. It is also possible for the belt to wear out prematurely if it is contaminated by an engine oil or coolant leak. There are two types of engines that use timing belts. The first is a “non-interference engine.” With this type of engine, if the synchronization between the valves and pistons is lost there will be no internal damage. If the timing belt breaks, the engine will shut down and leave you stranded but no other damage will occur. The second type of engine is an “interference engine.” With this engine, the pistons and valves are much closer to each other so if the timing belt should break they will crash into each other and cause serious engine damage. The damage is usually in the form of bent valves, but in severe cases where the belt gives way at very high engine speed, the valves can literally punch a hole in the top of the pistons. 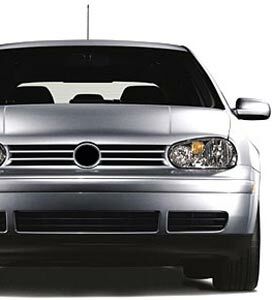 Virtually all modern VW® and Audi® engines are the interference type. Most timing belt failures that we see are the result of failure in one of the other components of the timing belt system. The timing belt system consists of the timing belt, of course, an idler or roller pulley, a timing belt tensioner, and in most Audi® and VW® engines, a water pump. All of these items are driven by the timing belt and have internal bearings that are subject to failure. It is usually one of these other parts that fail and cause the belt to overheat and self-destruct, not the timing belt itself. It is very important to not disregard squealing or abnormal noises coming from the front of the engine as this can be an indication that one of these parts is about to fail. These parts almost always give ample indication that they are ready to fail and major damage can be avoided. For reasons given above, it is highly recommended that all the components of the timing belt system be replaced at the recommended timing belt service interval. The Auto Gallery is not affiliated with Audi® AG or Volkswagen® AG.